This unique and beautifully designed rustic table features iron accents. It would look great in your Mexico Living Room along with the matching Indian Coffee table. We also have Indian style arm and side chairs available. These pieces combine Mexican rustic with a more exotic design and flair. This console table may also be used in your Mexican home office as a lamp table, a place to display art or brochures, or as a great accent piece. 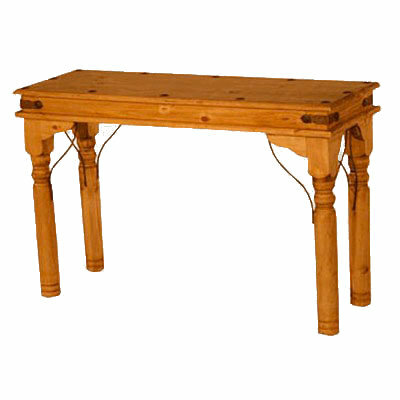 Take advantage of our many stains and finishes to make this table even more unique, even more your own design.